The beginnings of homemade apple cider vinegar, I hope. Looks, uh, appetizing, doesn’t it? There are moments when I question why I keep this blog. When I look at that picture, I have those moments. I’m a decent writer. I love to write. I’m a decent experimenter. And I do so enjoy a messy kitchen. But I’m really awful at following directions, and 70% of the time, I screw things up. Royally. This apple cider vinegar experiment – it’s a tragedy waiting to happen. Or a monumental success. It clearly can’t be anything in the middle. 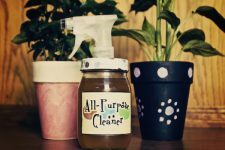 It stands to reason that any time you have a jar full of rotting, stinking juice sitting on your kitchen counter, you might start to question why you’re doing what you’re doing. If you want to join me in this journey of stinking, scummy, but potentially glorious vinegar-making, here’s how I’m doing it. By no means am I saying it’s the only way. I just chose the way that seemed the easiest and least offensive (believe it or not). First, you start with a whole bunch of apples. You don’t need the meat of the apples, per se. 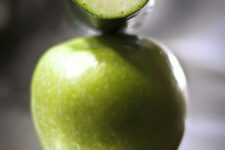 You just need the cores, skins, and maybe a little bit of extra apple chunks to give you extra vinegar. The amount above was approximately 10 apple cores and peels and 1 apple’s worth of meat. It’s especially important to wash the apples very well and cut out any offensive dark spots. The quality of the apples will determine the quality of your vinegar. Or so I hear. This is why it’s also very important to use organic apples – you don’t want pesticides and icky fertilizer chemicals in your vinegar. 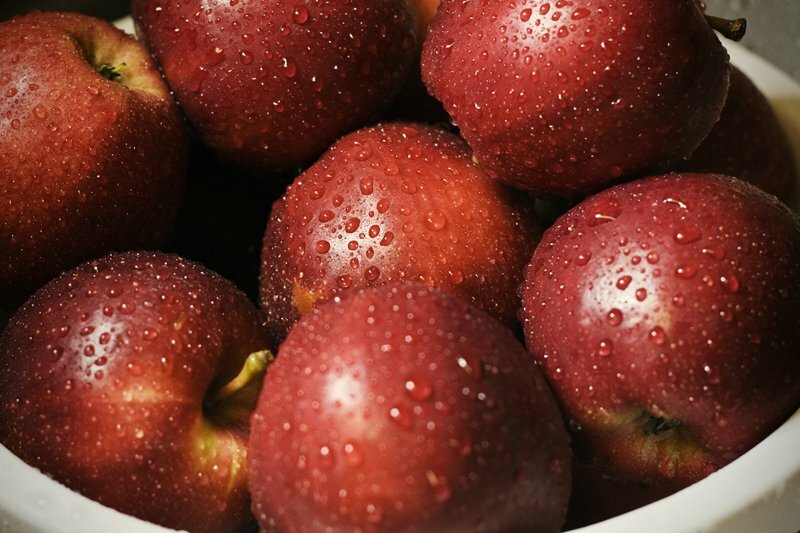 Wash, your apples well … and know they love you. After you’ve washed and scrubbed your apples into shiny, pretty balls of red, you’ll want to start the peeling/coring process. 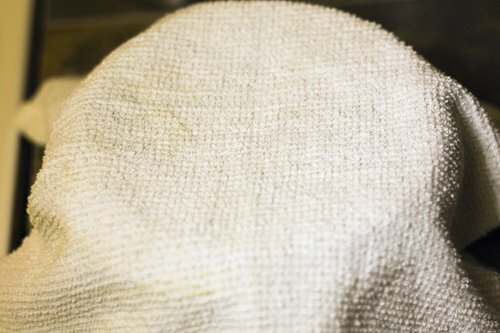 What you do with the meat is up to you, but I recommend you refer to the post about homemade applesauce and face mask and shampoo for some ideas. So you peel. And you core. And you take pictures, because you want to document this entire slightly insane extremely curious adventure for posterity. 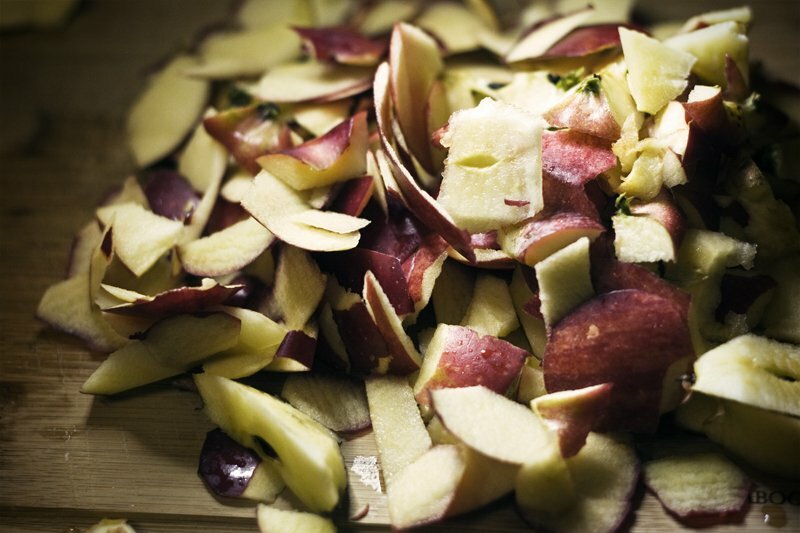 Apple scraps = apple cider vinegar … some day. 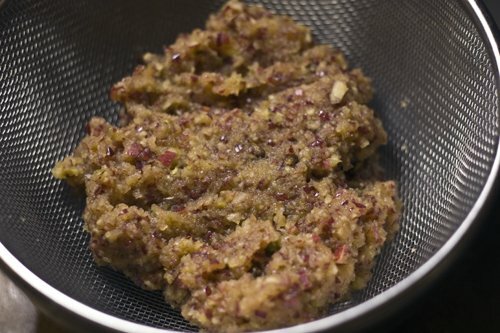 After you have a fair amount of scraps before you, you toss them in the food processor and let them turn into a big apple-y mush (about 3 minutes). The juice/scraps will start to oxidize and turn brown very quickly. But that’s okay! The whole point of this is to let the juice go so bad it becomes good. After you have your juicy scraps all mushed up, put them in a fine mesh sieve over a big bowl. Over that, place a heavier (and smaller bowl) on top of the scraps. Push down. Juice, baby, juice. I did that three or four times, and then got bored and put a towel over the top (to protect everything) and left it – bowl on top of scraps – to continue the overnight juicing process while I slept. Fall asleep and let gravity work. Mush the juice out of the scraps. Push the bowl down to juice more. 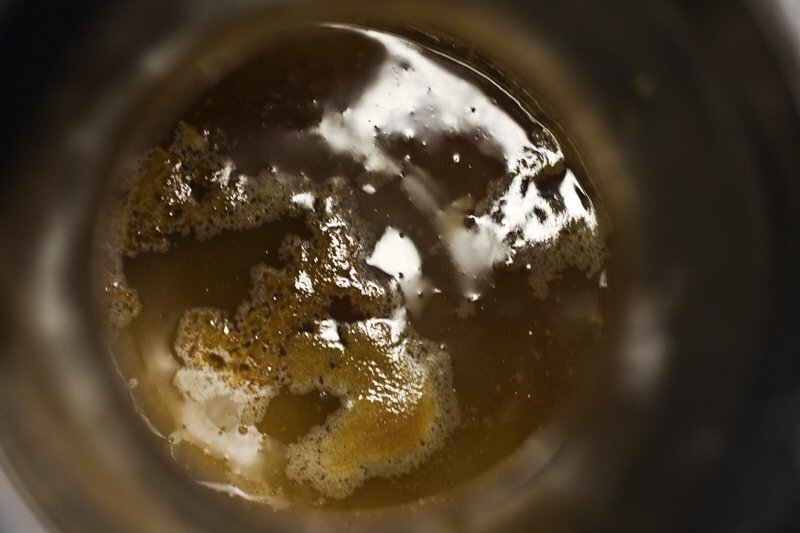 So when you wake up the next day, you should have a bowl full of apple juice (that’s already gone quite brown). Hooray! Now, for the next part. Put it in a jar and cover it with cheesecloth. And leave it alone. 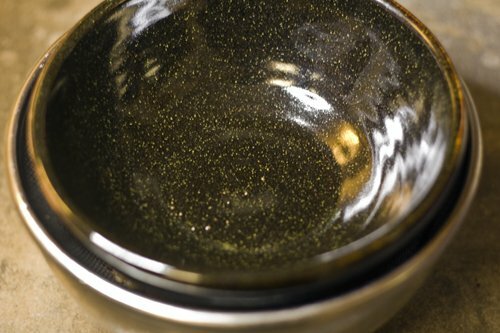 But leave it alone somewhere slightly dark, but warm – you want it to stay in the 70- to 80-degree temperature range. That’s the best temperature for fermenting to occur. I’ve more or less left mine alone for a week now sitting toward the back of the kitchen counter (where it’s darker) in a house that’s usually about 70 degrees. The only thing I’m missing are the fruit flies so many people say you WANT to have visit your vinegar while it’s fermenting. They’re like little vinegar fairies or something – sprinkling magic fly gunk on the rotting juice, turning it into something hopefully edible. After a week of sitting (without fly fairies) here’s what mine looks like from the top. Queasy stomach? Don’t look. Nature is making apple cider vinegar. Isn’t it cute? Confession. I put a half teaspoon of yeast in mine. It’s supposed to make fermenting faster. You can’t use regular bread yeast for this – you need wine or beer yeast. 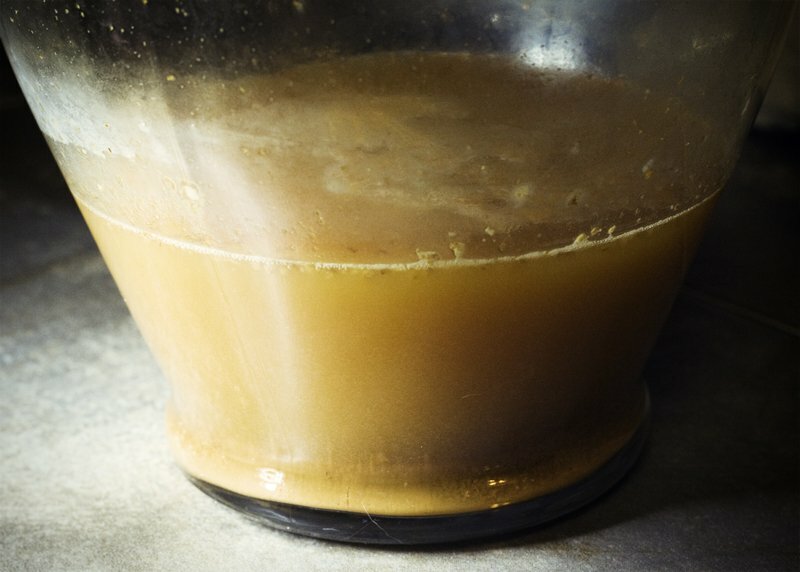 I happen to have a good line on beer yeast, and I figured I might as well use it, given that I hardly have the patience to wait for a drink at the Sonic Drive-Thru, much less vinegar to ferment for 4 months. From what I understand, the addition of yeast will cut the fermenting process down in about half. So I can expect real, delicious, natural, not disgusting apple cider vinegar in 2 months instead of 4. Lest you think I’m completely crazy, I wanted to show you the difference between Bragg’s and the vinegar I’m making (that’s not even remotely close to being done yet). It was wholly reassuring to see that they actually look very similar at this point. Even if the homemade stuff smells like a college boy’s wine-soaked socks at the moment, I have great hope. Bragg’s vs. one-week-old homemade ACV. There. That should be good enough to get us all started for now. I’ll keep you updated on the level of success or utter failure, in about two months. Everyone send good apple cider vinegar vibes this way, mkay? Ok, I found you this morning and now wonder where you have been all my life. That said, I have been dying to make vinegar, but am afraid. With just a cheese cloth covering, is the odor noticeable in your kitchen? Amazingly enough – no. However, I did put it in a jar (actually, it’s a big glass vase) that has a barrel base and a thinner top, so that might be helping with the smell. The only time I can smell it at all is if I lift off the cheesecloth and stick my nose inside and inhale. Needless to say, I don’t do that very often. This is so cool! I buy Bragg’s by the gallon, so this would be very nice for me. But I’m wondering if that bit you have there is a starter that you can use to make more ACV, or is that it? It seems like a lot of work for not very much vinegar. Well, my plan is to save a good bit of the mother to use as a starter for next time. The amount is probably a little more than it looks like, because of the particular jar and the angle. I eyeballed it, and I think it’s about enough to fill up one of those Bragg bottles. I, too, thought it was pretty meager for the amount of apples I used – but! – it was just the cores and the peels mostly, and I think if I do this again, I’ll just blend up whole apples and juice those. The cost will actually be pretty similar, I think, to buying ACV (if apples stay the price they are now, which they won’t, ’cause they’re not in season right now). Toward the fall, I expect it’ll be far more economical to do it this way than to buy Bragg’s. That being said, I love and trust Bragg’s, so it’s not a function of wanting to make something that’s less toxic than store-bought. Mostly, this was just an exercise in “learning how to do things the olden way.” You know, just in case I need to know some day. Hmm – that makes me wonder if I can use the mother from my Bragg’s to start some. Do you know anything about that? I know it grows be/c it often clogs up the squirt top of the bottle I keep in the shower for my hair even though I strain it when I make the solution. Y’know, I don’t see how it WOULDN’T work. I’d never thought to pay attention, but now that you mention it, the mother in my bottles grows, too, but only after it’s been opened (and used) a few times. It’s probably the oxygen that’s helping it work. So if you put a little mother in the apple cider/juice, the oxygen that you’ll be letting in will help it do its fermenty work even better. I say go for it, if you try it. In fact, I may just try to pull a little out of one of my bottles and put it in what I’ve got going up there. Maybe I can speed it up even more. Ha! I got my beer yeast from a local brewery (which is where Skip works), so you could ask any local brewery if they have any. Also, I’ve read that wine making stores have them, though I have no idea what those are (I’ve never seen one). But a local brewery or maybe a place that makes local wine would have some. All the websites I perused said they come in cakes, but mine was just loose yeast granules … so hopefully it’s the right stuff. I don’t usually use (or even have) that many apples at any one time… do you think this would work if I saved up my cores and skins in the freezer until I had enough? That’s a great idea, Stephanie. I think as long as it doesn’t destroy the sugars in the apples (I don’t see why it would), it would be a GREAT alternative to just going out and buying a giant load of apples for vinegar-specific purposes. You and your freezer! It always offers such great options – and I don’t even think about it. Also, I did read that you can continue to add “juice” up to 2 weeks after starting your vinegar, so if you went through a couple of heavy-apple-eating weeks, that might solve the saving-up problem too. I can’t wait to hear how this turns out! I bet it’ll be great! The boys and I need to try this. It seems like it could pass for a science fair project! It SO could! Two birds with one stone, it seems. Do it! Seriously, this is amazing and I hope it works out because…I am on the HCG diet and can only have apple cider vinegar. If I can make it at home, that would be…awesomesauce!!!! Haha. I haven’t heard awesomesauce in forevs! I don’t know much about this HCG diet … I’ll have to look into it! Curious. Send good vinegar vibes. It’s feeling vibealicious already, but it can always use more! I have a juicer. Can’t I just juice the apples in there and use that, rather than using the bowl on a bowl method? Mine are juicing now, and of course there are pictures for prosperity! I love that you posted this and gave all the details of how to make it! I’m curious how it came out!?!? Do you have an update? Thank you for the recipe. I have an apple tree in my backyard and love apple cider vinegar. This is the first year I plan to combine the two. So, I’m wondering, how did yours turn out? Aha. I knew someone would ask sooner or later, even though I hate my answer. I moved while my vinegar was “vinegaring.” The first day I moved into the new apartment, I set my container out on the back deck, just to keep it out of the way. Then … I forgot to bring it in. Five days later, I look out at it, and the cover had blown off and it was full of leaves and dirt. 🙁 So, sadly I don’t have a report to give. I plan on trying again this fall when apples are all over the place and in season. In the meantime, if you have a good report soon, I would LOVE to hear it! I’m sorry you lost your batch of vinegar. I would love to participate in a ACV challenge! Sorry you lost your first batch! I want to give up but the price of apple cider vinegar is ludicrous here. Not even organic stuff, not even a big jug of it, just a lil ol bottle of No Name. Stupidly priced. My contempt for the price of ACV is the only reason I am saving up apple scraps in my freezer again for round 2. Ok brain, it’s go time. 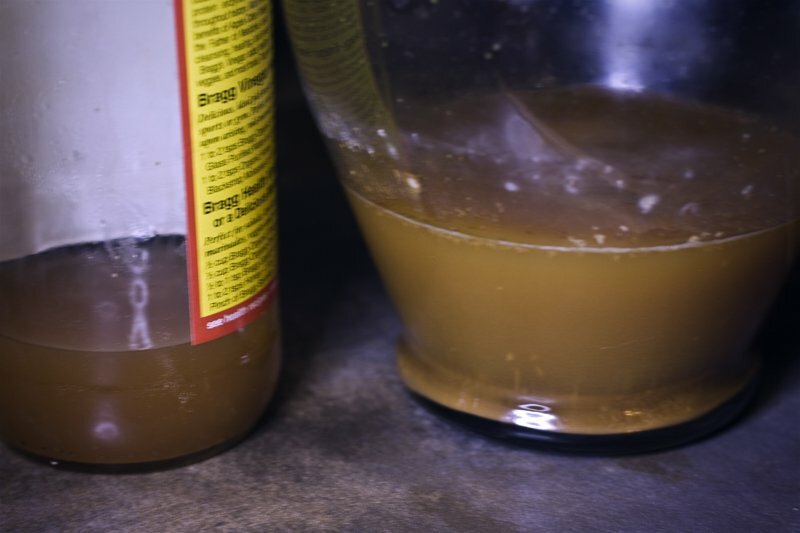 I am making my vinegar but the problem is the cores keeps floating over the water and there is something looks like mold but I am not sure if it’s mold or mother. please help me.. I really need to know if it’s ok to keep it or should I just throw it away and start a new batch. pure dollars, there is the publicity oor non-privacy cost for a family.